It’s not often that I eat dinner solo these days, but one recent evening when John was away, I walked to our local Whole Foods and went straight for the hot food and salad bar. Have you ever been there? That place is like magic! It was there that I fell in love with caramelized plantains. Oh mama. One bite in and I immediately knew I had to recreate them for the blog. I’m not sure what fats or sugars are used in their version, but I wanted to clean things up and infuse some extra flavor. More flavor is always better in my opinion. Instead of relying on brown or cane sugar, I went with coconut sugar – a more natural sugar extracted from sap of cut flower buds on the coconut palm. Crazy awesome, right? A lot of you guys have been asking me if I ever use it and have also been subbing it in a lot of our recipes for cane sugar, and it got me curious. So thanks for the tip! I haven’t done much baking with it yet (recommendations / tips welcome), but what I do know is it works fabulously for caramelizing. This recipe is simple, requiring just 5 ingredients and 15 minutes. And the flavor pay off is HUGE. To ensure the plantains got nice and brown I went for coconut oil, which infuses a little extra flavor. 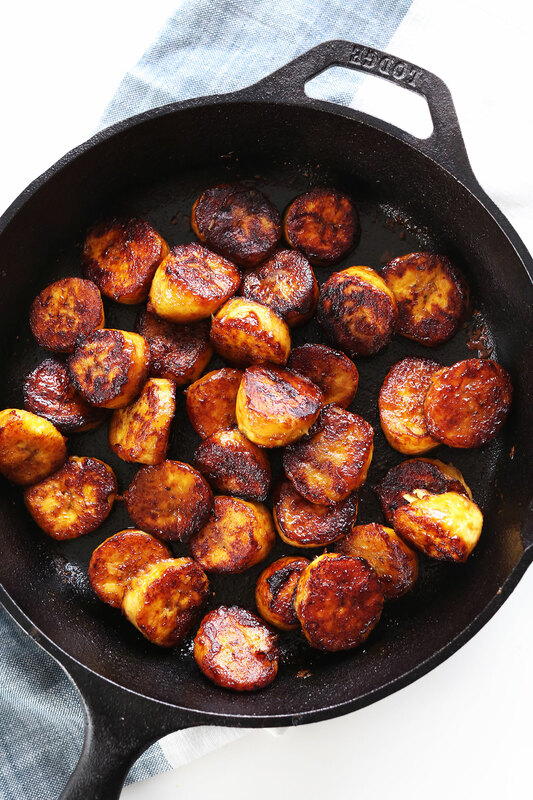 And I doused the plantains in coconut sugar, cinnamon, and a pinch of salt before throwing them in the pan – a cast iron is ideal if you have one. What happens next is pure magic. 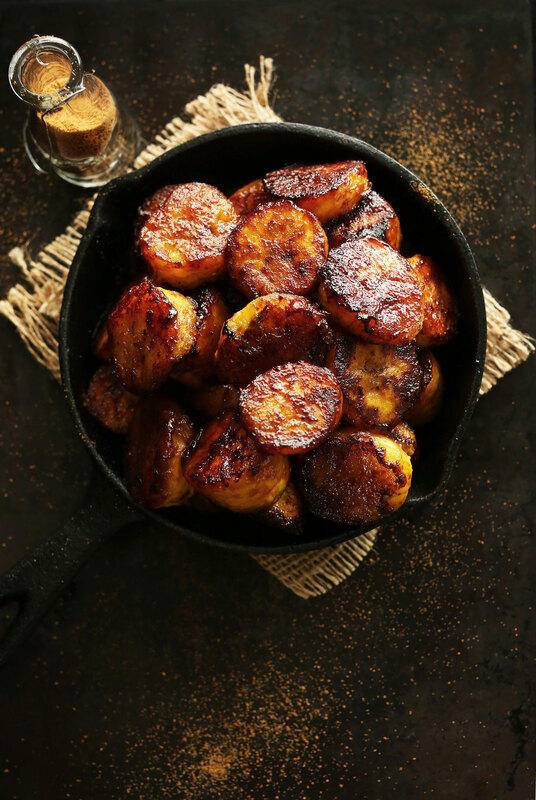 The outside of the plantains get all brown, caramelized and sweet, and the inside gets extremely tender and melt-in-your-mouth worthy. Can we say, new favorite dessert? I served my plantains with some coconut whipped cream and additional sprinkle of coconut sugar. So good! But I also think they would be amazing with my Coconut Sea Salt Caramel Ice Cream! Can we say best vegan ice cream sundae ever? If you guys try this recipe, let us know! Leave a comment and rate it – it’s super helpful to us. And, don’t forget to take a picture and tag it #minimalistbaker on Instagram so we can see! Do you realize there’s more than 7,000 #minimalistbaker hashtags on Instagram thanks to you all? That’s amazing! Keep tagging and keeping up the the good vibes. 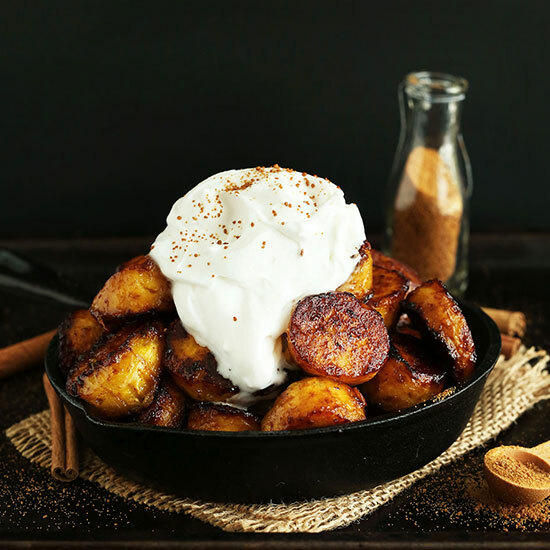 5-ingredient, 15-minute coconut sugar caramelized plantains! Refined-sugar-free, vegan, gluten-free, and so delicious. 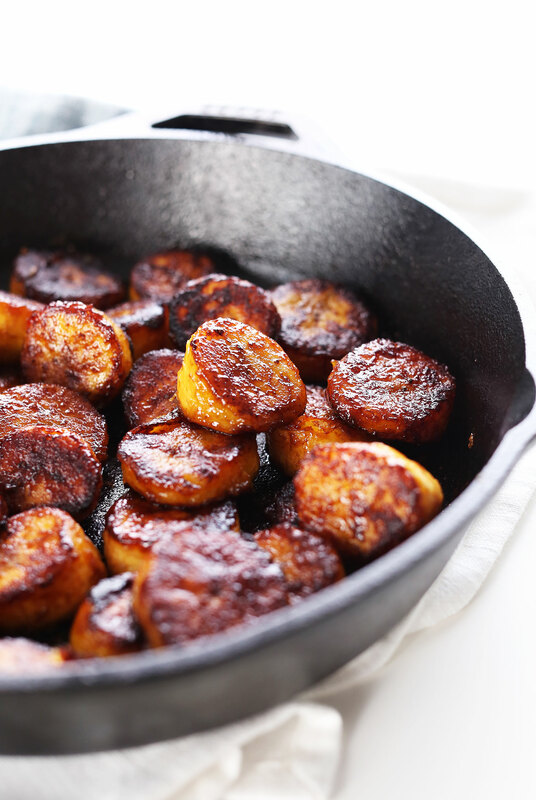 Heat a large cast iron or metal skillet over medium-high heat and chop your plantains in 1/2 inch slices. 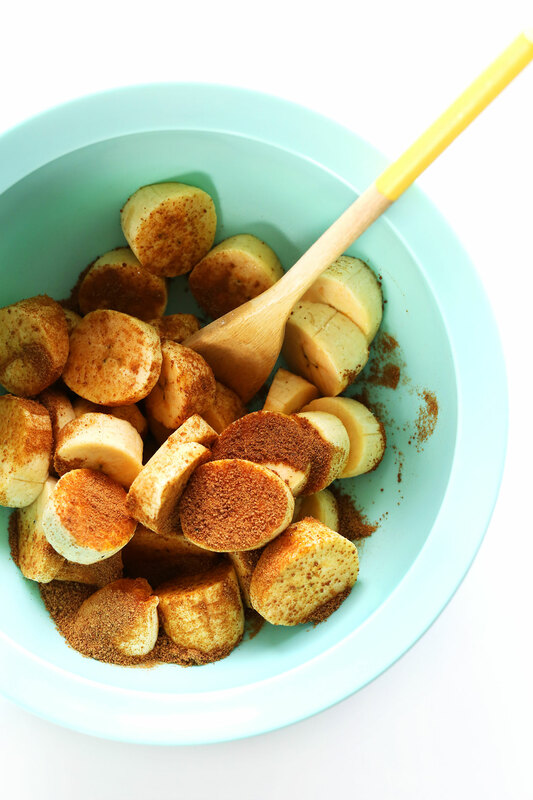 Add to a mixing bowl and toss with coconut sugar, cinnamon, and sea salt. Once the skillet is hot, add coconut oil and only as many plantains as will fit comfortably in the pan without crowding. Cook for 2-3 minutes on each side or until browned and caramelized. Serve warm with dairy-free ice cream or coconut whipped cream. Best when fresh, though leftovers will keep in the fridge covered for a few days. *Recipe adapted from / inspired by Whole Foods. Would this work without a cast iron or skillet? Hi Romina, You could potentially toss the plantains in sugar, cinnamon, salt, and oil and roast at 400 degrees Fahrenheit for 15-20 minutes (or more). 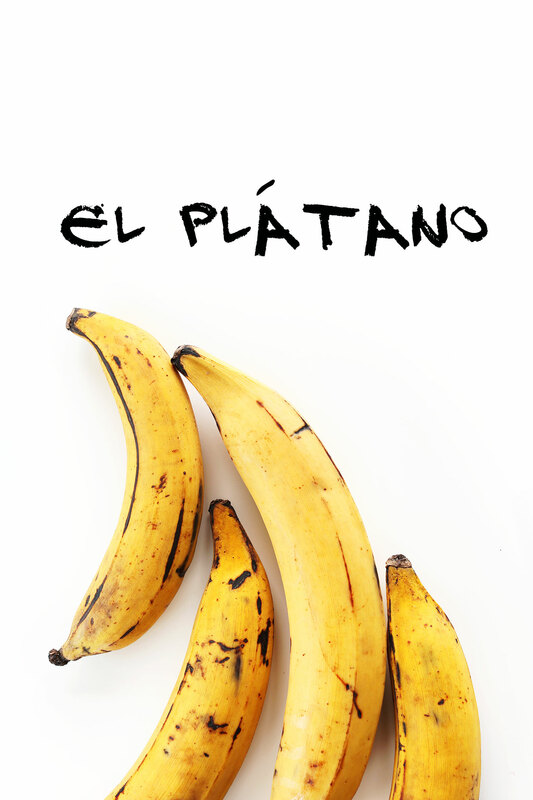 For more info on roasting plantains, you can refer to our Black Bean Plantain Arepa Sandwiches. If you give it a try, we would love to hear how it goes! Delicious! I’m enjoying them with refined black beans, guacamole, and purple cabbage slaw! Hello There. Just a suggestion for when you cook with plantains. I suggest you try and use ones that barely have any yellow/mostly brown . These will be quite soft in texture but shouldn’t mush or they will be overripe. These are when they are at peak sweetness. If you fry them at this stage, you probably wouldn’t need to use any additional sugar. They also will caramelize and cook faster. Let me know how it works. That is how I enjoy mine. Love your recipes, good to add some interesting variety to my diet! Is there anyone that i can talk to about this recipe? I have been looking around a lot for a recipe that i can use for my final assignment for the end of my classes and it has to be indonesian. I do not know if this is actually indonesian or if it just popped up in my searches but i would like to verify. Thank you. Hi Maria! I wouldn’t say that this recipe is Indonesian. Hope this helps! I made these with a blend of coconut and cane sugar. The medium-high heat and hot skillet is too hot. Between the high sugar content of the plantains themselves, plus a sugar coating, they burn instantly and develop an acrid taste. The skillet needs to be at medium low, and they need to be cooked in the coconut oil for about 5 minutes before you add the sugar and cinnamon, then turn the skillet to low and let them carmelize a bit more. Can unripe regular bananas be used? Wow! I am definitely going to try this very simple recipe. This recipe was super easy and super delicious! I definitely recommend trying this recipe. I made it for my guests and they just loved it! This looks fab – will try if I ever find plantain in the supermarket! I use coconut sugar in a lot of my baking, my favourite is in pineapple upside down cake but I’ve recently discovered makes chocolate cakes and brownies have a much richer flavour! For the last two weeks I have made one of your recipes everyday! No words can describe how happy I am. The plantain recipe makes me wish there was a hands down finger licking emoji lol! That coconut whip cream……the end….what a blessing. Lol! Funny you categorize this as dessert. I’m from Puerto Rico, and plátanos are a staple in our kitchen. We cook it every which way. Ripe plantains are typically deep fried and are called “amarillitos” (literally, little yellow ones), and they are naturally sweet. We serve those as a side dish. They are scrumptious!! Just made this and it turned out amazing! First time cooking with plantains, success! Thanks Dana! Does this work with regular bananas? Medium high heat for coconut oil is way too high. Unless you want to smoke out your house medium heat (350 max) is a better place to start. Otherwise the plantains are tasty. First, I had no plantains, but simple bananas I bought for breakfast over a week ago and then somehow forgot abotut them every morning. Second, I had no coconut sugar but used normal sugar made from sugar beets. Third – no whipped cream. I was also thinking about omitting the salt since I’m not much into that salty-sweet / chili-chocolate stuff you get everywhere nowadays, but I’m happy I didn’t! I would have licked the skillet if the caramel wasn’t so hot (so I used a dough scraper instead). Mmmmmmm, fried plantains! My husband is from El Salvador, so we eat them often. 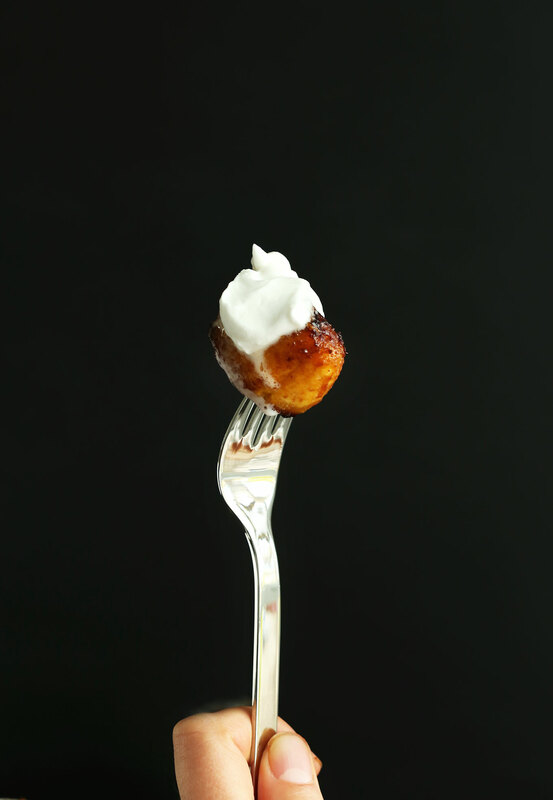 We like them with retried beans & cream (like sour cream). Can’t wait to try these this weekend! So glad I’ve found your blog! Not only it has quality pictures and mouthwatering recipes, but you give it a very personal touch while keeping everything simple! Bravo! ooh, I bet these would be so good over a nice bowl of oatmeal for breakfast, maybe with some shredded coconut and walnuts..
Omigosh, these are so delicious!!! Coconut sugar caramelizes perfectly. I want to eat this every day! I also topped it with your coconut whipped cream which was a perfect pairing. Thank you! I give this recipe 10 stars! I just made these and they are FANTASTIC. My friend says he’s used regular sugar before and it’s the same but I told him he needs to try these with coconut sugar – – like the recipe says. It caramelizes perfectly and the cinnamon and the pinch of salt were perfect. I will definitely make this again. Thank you for sharing! Holy smokes! These look just magical. I love plantains, but I tend to kind of forget about them (food blogger problems?). But now I want them soooo bad. Gorgeous photos, as always. Yummy plantains…I love my plantains semi-sweet and fried as well but never tried caramelized plantains. Am getting hungry now! I LOVE cooked/fried plantains. These caramelized ones look incredible! I can eat the entire batch! Hi, I’ve been subbing in coconut crystals as my autoimmune disease reacts painfully to sugar of any other sort with INFLAMMATION! So thanks for a try here, I appreciate not having to change up a recipe. BTW , when baking I use more of the coconut crystals and then some bustle via to make as sweet as needed. Made these last night and my daughter and partner were in LOOOOVE (as was I) sooo good! My partner is form Souther Mexico and has had his fair share of platano frito and said this was one the best desserts he’d ever tasted. Delish! I have never been there- (seriously- any time Whole Food’s want’s to open a store round here I will be first through the doors!) but they have food like this there? Oh my! Thankyou so much for creating this for us Whole Foods deprived people! Also- coconut sugar? It just sounds even more yummy now! man that looks sooo good! another one i’ll have to try out, since my wife loves plaintains. Oh my! These looks so delicious. And with the coconut whipped cream! Oh lawd, I cannot handle myself! Must get my hands on some plátanos prontito! Gah, I’ve had the caramelized plantains from Whole Foods and they are epic. Love this recipe. Glad you agree, friend! They’re magical. ooh I love plantains! This recipe sounds and looks soo delish! Coconut sugar?! I need to buy me some of that asap. Yum! 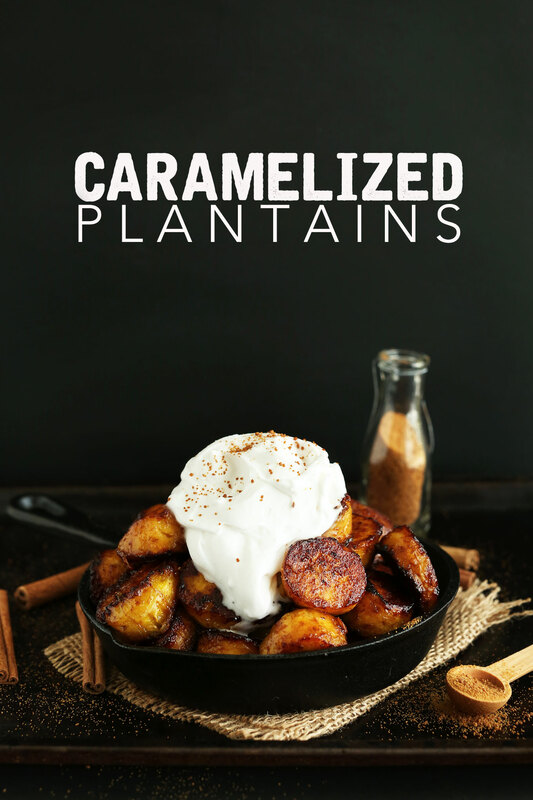 I love caramelized plantains! These look really delicious! Your posts make my mouth water EVERY TIME!! This has gone into my To Do list. Yum! I’ve been eating plantains my whole life. They are the only thing I miss from since I moved to the states. In Puerto Rico we eat these as part of our meal, but I love the idea of straight out eating them for dessert. They are so versatile, right? Delicious! Oh my god, you’re killing me! I love fried plantains, but not you’re going to add caramelization and coconut. Holy crap! I am drooling. No seriously, saliva just fell from my mouth and onto my keyboard. It was gross. But this… you took plantains to the next level. Well done. This is fantastic! The caramelization on the plantains is incredible!!! Whoa these look divine!! Campfire food for the summer for sure! OOH YES! What about on a s’more?!! Oh dear…. We usually use butter and honey for our plantains but that combo needs to MOVE ASIDE!!! I’m all over these! DUDE, now it’s on my list! Thanks for the tip! I use coconut sugar for everything. I don’t use any other granulated sugar at all. It is amazing in baked goods and whatever else you can think of. I have made this exact thing before and OMG so good! Plantains are da bomb! Thanks for sharing, Zoe!! I’m starting to use it in place of sugar in most things these days, too! This looks delicious! I’m going out to find plantains–asap! There is a difference between ripe plantain and a yellow plantain. When the plantain is actually ripen you can eat it like a banana! It’s so good and so much sweeter! It does turn to a black-brown color but it doesn’t mean it got bad, that’s actually when it’s good and it has a lot more nutritional value! I do like this recipe and I wish to try it out one of this days! Thank you for all the great recipes you make! YUM!! Just had some plantain yesterday but more boring than anything (maybe not boring but plain and simple)! These though are the ones that I would make and my hubby would jump right into!!! I use to eat plantains a lot when I was a child and stop for not specific reason… I’m back on the wagon!!! Mmm, I do love the Whole Foods hot bar for lazy dinners. Haven’t tried their plaintains though, will have to do that next time I end up there for dinner. Wow! These look and sound amazing! I first tried (and fell in love with) carmelized plantains at a Brazilian restaurant (Fogo de Chao – where they basically just bring hunks of meat to your table over and over again) back in my non-vegan days. I never thought about trying to recreate them myself – thanks for inspiring me to do this at home! Also – I hear you about Whole Foods. It’s like a magical wonderland, the employees seem to get it and they help me find stuff and actually spend time talking to me about food. I could spend hours in there ogling all the goodies! Holy yum! These sound (and look) magical. I fell in love with plantains in the Dominican Republic last year, and am always looking for new ways to make them. I need to give this a try! In terms of coconut sugar, I’ve had it work well as a substitute for both brown sugar and cane sugar in baking – it’s super versatile and my favorite kind of sugar! Thanks for sharing! Just tried baking with it for the first time and had really good results. I’ll be sure to swap it in for brown sugar soon! It looks good, but what exactly is a plantain? Is it different from a normal banana? Yep! It’s bigger and firmer with a less sweet taste. But they ripen and mostly look like a banana! They’re ideal for caramelizing or even making savory or sweet chips! Aha! They sound quite nice. I’ll try to find out if they are sold in my area as well. Thanks! Wow-ok, comment #2! I use coconut sugar in baked goods where I need a deeper, almost molasses-like flavor. I think it takes on a graham-cracker-y flavor when baked. It is waaay stronger than the flavor of sucanant, and I also find it dissolves more readily (probably particle size related). I have used it in cinnamon rolls (sub for sugar/brown sugar in the filling), sprinkling over biscotti right before first bake (smells ah-may-zing while baking), caramelizing bananas (!! ), and have even used it in small quantities in homemade almond milk as a replacement for honey/agave/maple syrup. My next adventure: using it in cherry pie this weekend! I bet making a caramel sauce would be delicious, too. Thanks for the tips, Annaliese!! I like your idea about using it as a pie sweetener. Great ideas! Oohhhhh dang girl dang these sound insane! I had caramelized plantains at a nice Mexcian restaurant and they blew my socks right off. I’ve been dreaming of them ever since so this recipe has my name alllll over it. This looks and sounds remarkable. I used to make a meal out of caramelized plantains when I used to frequent a Salvadorian restaurant a few years ago. They are incredible. I haven’t had any since and never thought to make them myself! Genius as always! So easy at home! And SO fresh! Seriously read my mind (and also the recipe hanging on my fridge!). I just made a caramelized banana smoothie (ok-milkshake because I used Luna and Larry’s Vanilla! )…and it was so friggin’ good!! I foresee caramelized fruits as a big summer trend…perfect!! I like your trend forecasting :D Your milkshake sounds amazing!! Hi Dana! I love your website (your 5 minute hummus is one of my staple recipes). I’m wondering where you usually buy plantains–I’ve looked in Whole Foods, Trader Joe’s and standard grocery stores without success. Maybe I’ll have more success in the spring? Hi Molly! I’ve seen them at several grocery stores, but this time I had luck at Whole Foods. They’re green most of the time, so I had to let mine ripen for several days! Otherwise, try Mexican grocery stores. Oh my goodness, that looks and sounds incredible! I’ve never heard of coconut sugar before, I’m intrigued. Think coconut turned into sugar. It’s amazing! 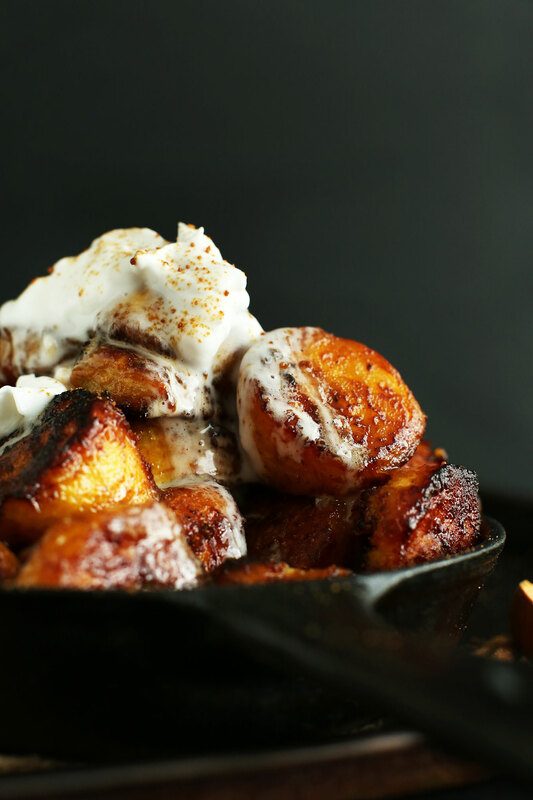 if you love caramelized things, you’ll love these! I’ve tried caramelizing bananas, but never plantains! This is beautifully delicious! I think I’m the only one in my family who loves plantains– which means more for me! Have to try rolling the plantains in coconut sugar and cinnamon before frying them! Yum!! this looks so tasty and delicious!! Yum! This looks so great and easy to make!